Selma is sick and not able to work on a challenge card this week. I have not had any time to work on one either, so I picked one of my favorite cards that Selma recently did and we will use it for this week's challenge. You can read all about it by clicking here! 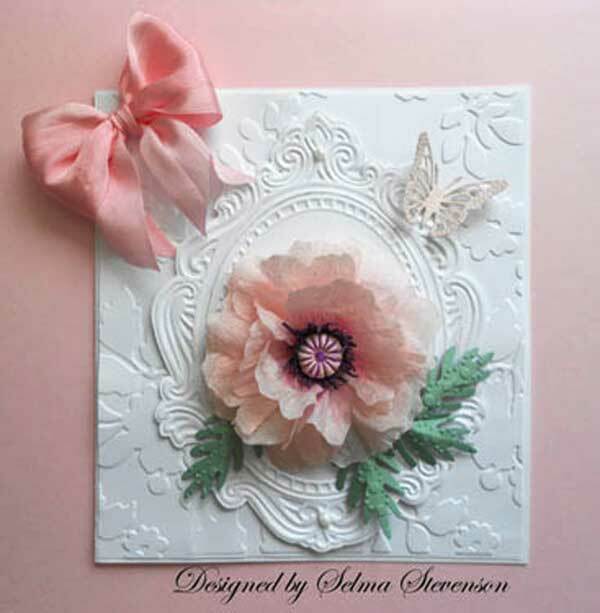 Selma also did a great tutorial teaching us how to make this beautiful poppy in her post. This week, you can enter 3 cards. You will have until next Thursday, June 13 morning 6:00 AM EST to link your project. A winner will be chosen from a random drawing for week #22 The winner of the challenge will be announced Friday, June 14. This week's winner will receive a Embossing Folder. The winner will also be entered in the 2013 end of the year $100 gift certificate drawing. 1 You must have a blog or post to the SCS gallery. 2. Post your challenge card to your blog. 3. Or if you are posting to the SCS gallery, you will need to use a special code to tag your card to the challenge. This week's code is joansgardens, JG0606 and needs to be posted with the challenge. Please enter both on the same line with a comma between as I have shown. 4. Link your card/project to the Blue Inlinkz icon listed at the bottom of the challenge.